Viaja en el tiempo, todo el camino de regreso, hasta el momento de las terribles lagartijas. 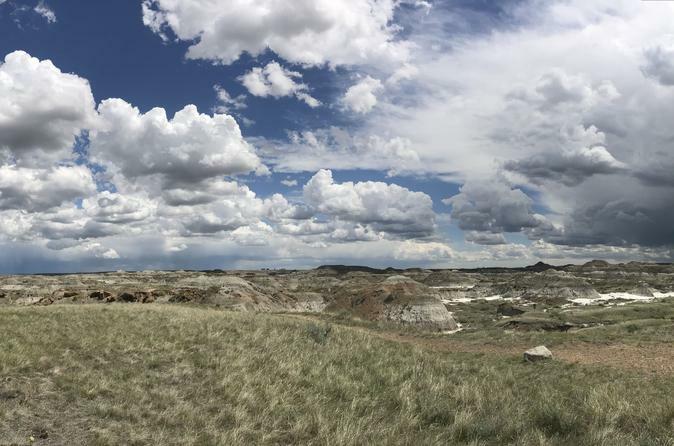 Dinosaur Provincial Park es una de las camas de fósiles más ricas del mundo, y esta es tu oportunidad de presenciar la asombrosa historia que está enterrada allí. 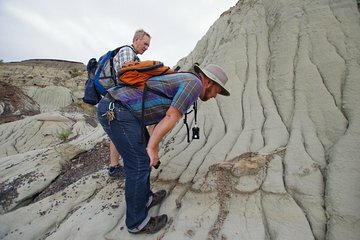 Viaje en autobús desde Calgary al Parque Provincial de los Dinosaurios, donde puede caminar entre los capuchas, profundizar en el centro de interpretación y tener un día que no olvidará. Transporte de ida y vuelta desde el punto de encuentro de la Torre de Calgary incluido. Prepare un picnic para llevar o comprar uno en el camino. It is such an amazing tour, I can see a World Heritage Site at Dinosaur Provincial Park , the badlands area is beautiful than the picture showing, it is a MUST activity when you were in Calgary, you can imagine and feel the living place of the dinosaur over 75 millions year ago, the tour guide Isabel is a wonderful, responsible professional and nice tour guide, when we hiked in the badlands trail and tried to find a natural dinosaur fossils in the park, mild raining appear suddenly, the park staff leave us first, but Isabel keep helping us to find the natural fossil so as to show how amazing the nature was at her greatest effort , we were really interested in it, she knew that it may be a once in a life time chance to visit the Dinosaur Provincial Park for us, she tried her best to show us as much as she can, we enjoyed the tour so much! I have joined many local tours from different countries, I did not meet a guide like her. Besides the dinosaur Park, she showed us the Calgary local culture that was not covered by tour and also the natural view, the tour exceed my expectation, thanks Canadian for the sharing, this is my life long memory. Overall this tour and tour guide was absolutely amazing and to be definitely recommended to tourists from all over the world.